Today's mani is done with a stamping plate from BornPrettyStore, and this plate has some swirly flower images, just what I love! It came with blue protective foil on front ánd back, it removed easily from both sides. There's no other protective cover on the back though, but the plate isn't too sharp without the blue foil. Catrice Karl Says Très Chic with China Glaze Elfin' Around and BPS plate QA27. I'm not sure why there's another image on this plate that's almost a duplicate of the one that I used (top right), but then in a different size. But it transferred perfect and I'm totally loving both full nail images on the right side, so I can't say that I care too much! You can buy this plate here for $2,99, and with coupon code ABJ61 you'll get 10% off. I used Elfin' Around for stamping, it's a great polish for that, the color varies a little between coral and pink, and the foil effect adds a little something extra. You can see my swatches of it here. Really like how it looks combined with that cute image! 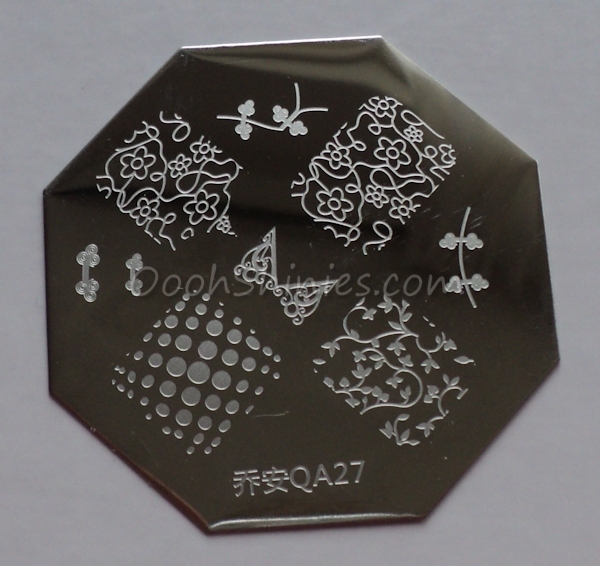 Of course I've also updated my stamping comparison! You can always find the up-to-date version on this page, simply because I'm too lazy to keep going back to older posts and update the image :) These images vary a bit more in size than the images of most platebrands, but I'm sure it gives you an idea of the size anyway!